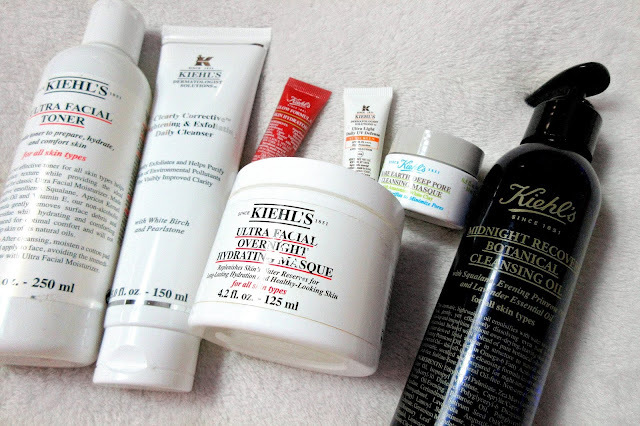 There is just one photo for this blog post, and that is the above photo of just some of my favourite Kiehl's products that I've accumulated over the past 4/5 months. 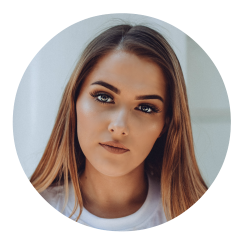 I've always been obsessed with beauty - makeup being the main point of that and it always will be, however, it's only really in the past year and a half that I've well and truly realised how important it is to invest in your skincare. Better skin = Better looking makeup! I first had heard of Kiehls when I saw Jamie Genevieve mention the brand in one of her videos but never really looked into it, then when I started my new job in a department store I was able to sample some of the Kiehl's bits such as the 'Ultra Facial Overnight Hydrating Masque' and I fell completely in love with it and wanted to try more and more products so my first Kiehl's purchase was the big tub of the hydrating masque and it's my favourite ever. The overnight hydration masque has a fun, jelly-like texture and feels so nourishing and refreshing on the skin - I like to apply this most nights to my skin before bed and my face is so soft because of this! The next purchase was the 'Ultra Facial Toner' which was recommended to me by the lovely staff at Kiehl's as I was asking them how I can improve my skincare routine - they recommended I incorporate a toner into my routine to restore my skins natural PH levels and to ensure I've got every scrap of makeup and dirt off my face at the end of the day. This toner isn't like anything else I've tried before, it actually feels quite creamy which is so much nicer than those harsh astringent type toners that feel like they're taking a layer of your skin off! Next up, is the famous cleansing sister of the famous 'Midnight Recovery Botanical Cleansing Oil' which is incredible and feels like a little spa facial on your face - the thing I love most about it is that you can use this around the eyes as it's ophthalmologist tested and it literally melts away your eye makeup so you don't have to faff around with a separate eye makeup remover - win! Recently, I was lucky enough to attend a work-related conference where I got to spend some time with the representatives from Kiehl's and they gave me a cute little goody bag which has the 'Clearly Corrective Brightening & Exfoliating Daily Cleanser' which the lovely Kiehl's man said would make my face glow - I've tried this out once and I really liked the way this made my face feel! The other little bits in the photo are some samples I've picked up and you can see me using most of these products in my new Instagram video here. Basically, I just wanted to write a Kiehl's dedicated blog post as I believe they've really helped to clear my skin and I've fallen completely in love with their brand - you should all run to your closest counter and get a free consultation!